We’ve packed some unusual things during our time at Barnes and Woodhouse, but one of the most striking and delicate pieces of work has to be Twist Design‘s Reliant Robin with stained glass windows depicting scenes of east Yorkshire life. Three Reliant Robins were commissioned by Artichoke for the Lumiere Light Festival in Durham 2013, all of which were spray painted black and had the windows recreated to mirror the stained glass of Durham cathedral. The front window of the car shows a multi-coloured depiction of the Angel of the North – which in itself is a representation of the evolution of the northeast from the industrial to the information age – while the sides and back present stunning images of coal mining and brass bands. Although the windows look like stained glass, they are in fact a kind of faux stained glass, made by incorporating plastic overlays onto the existing car windows which ensured that nothing was wasted in the creation of these cars. 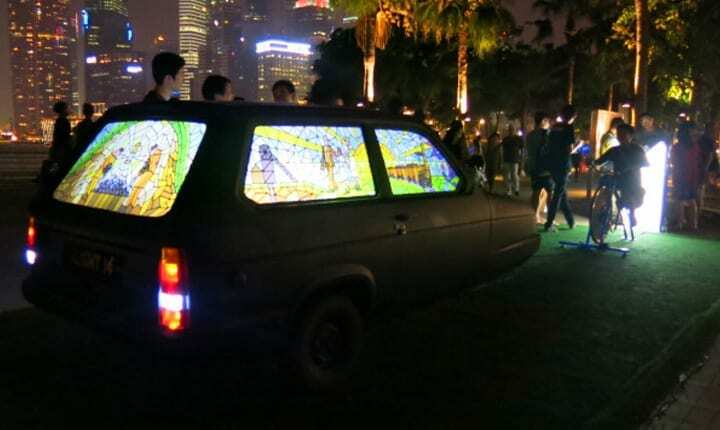 It also made the task of packaging and sending the cars to Singapore substantially less perilous, as the windows were not as expensive or breakable as genuine stained glass.At the iLight Marina Bay sustainable energy festival, the car featuring the Angel of the North was presented under the title “The Wheels of Industry” and became an interactive exhibit. By connecting the matte-black recycled vehicle to a kinetic bicycle, visitors were able to become part of the artwork by powering the bicycle to make the car light up from within. The Wheels of Industry raised many questions about the sustainability of non-renewable energy resources while making visitors directly responsible for the vehicle’s illumination. When it came to packing The Wheels of Industry, we knew we were in for a challenge. 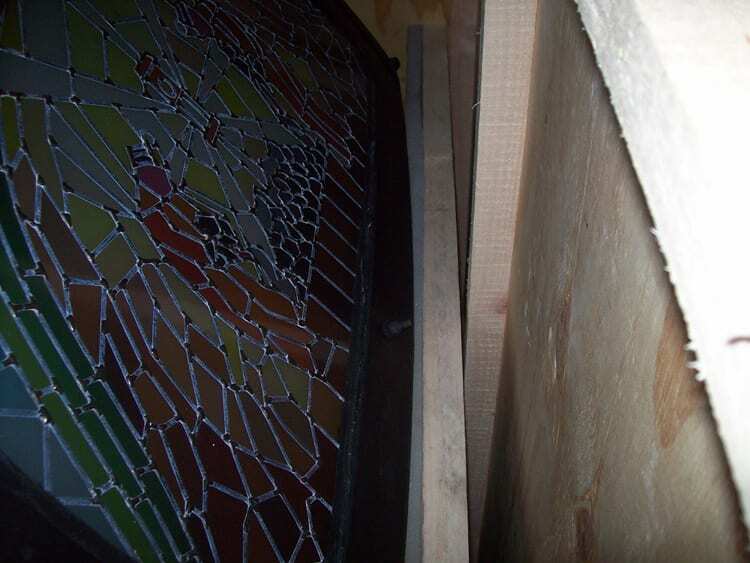 The windows might not have been genuine stained glass, but they were still fragile windows, which we decided to cover with shock absorbing foam throughout the journey. 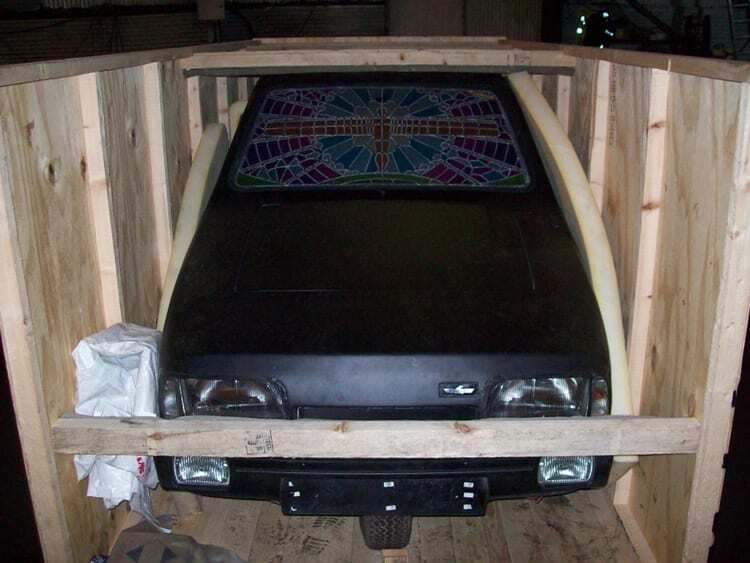 The crate itself was custom made so as to fit the Reliant Robin perfectly, with bars across the front and padding on the sides to reduce the risk of the car moving while in transit. 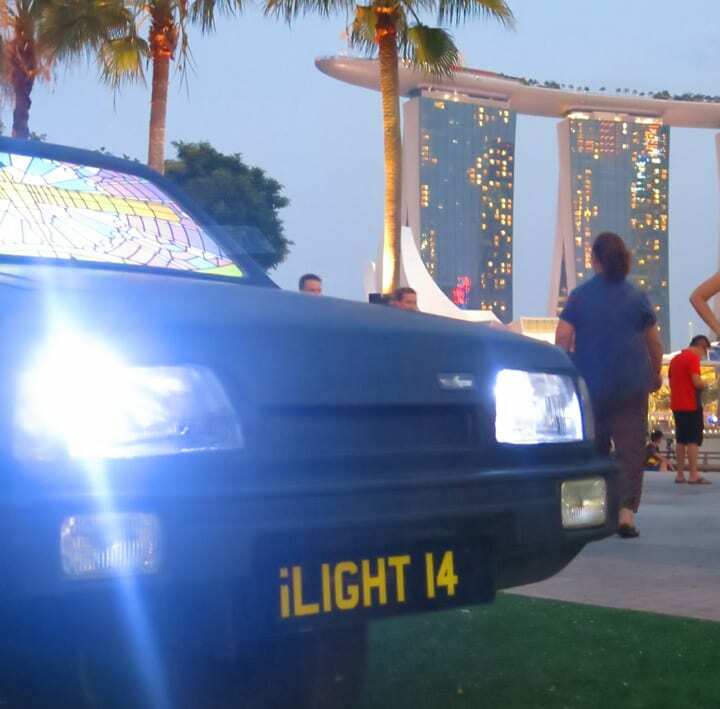 Just a few weeks later, The Wheels of Industry emerged from its tightly-packed crate in perfect condition, to become one of the focal points amongst the twenty seven installations of the groundbreaking iLight sustainable light art festival in Singapore.